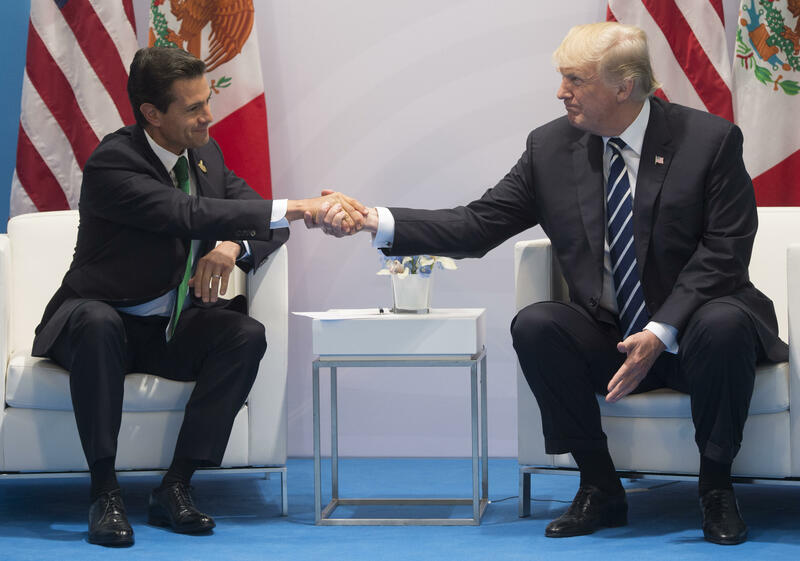 Mexico is firing back at President Trump after the president repeated his claim that that nation would be paying for his "big, beautiful wall" and once again pushed to re-negotiate the North American Free Trade Agreement (NAFTA). Amidst his tweets updating the country on the ongoing impact of Hurricane Harvey in Texas, Mr. Trump pivoted to the U.S.-Mexico border, writing "with Mexico being one of the highest crime nations in the world, we must have THE WALL." He noted, "Mexico will pay for it through reimbursement/other." Mr. Trump followed that up by tweeting "we are in NAFTA (worst trade deal ever made) renegotiation process with Mexico & Canada. Both being very difficult, may have to terminate?" The renewed claims are the first since transcripts of a January phone call between leaders of the two nations were acquired and released by the Washington Post, revealing a frustrated Mr. Trump pleading with Mexican President Enrique Peña Nieto to cease his public criticism of the proposed wall. "You cannot say that to the press," Trump said repeatedly to Peña Nieto in response to his public refusal to fund the border wall, according to a transcript of the Jan. 27 call obtained by The Post. "If you are going to say that Mexico is not going to pay for the wall, then I do not want to meet with you guys anymore because I cannot live with that," Mr. Trump added. In recent days, President Trump has gone so far as to threaten a government shutdown if he did not receive funding from Congress for a "downpayment" on constructing the border wall. "The obstructionist Democrats would like us not to do it, but believe me, if we have to close down our government, we're building that wall," Mr. Trump urged at a campaign-style rally in Phoenix last week. Now, Mexico is going public with its disapproval again, tweeting a press release in direct response to Mr. Trump's new claims. "As the Mexican government has always stated, our country will not pay, under any circumstances, for a wall or physical barrier built on U.S. territory along the Mexican border," the written statement from Mexico's Ministry of Foreign Affairs read. The statement went on to address Mr. Trump's claims of Mexico being a crime capital, saying drug and money trafficking between the two countries is a "shared problem that will only end if its root causes are addressed" including both high demand for drugs in the U.S. and supply from Mexico. "Only on the basis of the principles of shared responsibility, teamwork and mutual trust will we be able to overcome this challenge," the statement added. With regards to the president's threats to renogitate NAFTA, the statement said: "Mexico will not negotiate NAFTA nor any other aspect of the bilateral relationship, through social media or any news platform," knocking Mr. Trump's penchant for Twitter-driven diplomacy. The statement ended its list of responses to Mr. Trump by extending an offer to assist the U.S. with any recovery efforts in the aftermath of Hurricane Harvey in southern Texas, "as good neighbors should always do in trying times," Mexico noted.